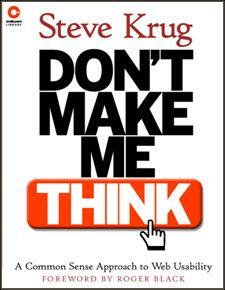 I’m a big fan of Steve Krug and especially the “Don’t make me think” mantra (because most people actually get the point). In his presentation at the Boston-IA chapter from Jan 26, this blog suddently shows up. Steve Krug refers to “25% of all web users are disabled“. Steve Krug. I’m amazed! I’m actually thrilled about this, because that means that we get some attention from people that we really look up to. I’m interested in hearing more about the Boston Meeting, and will be very excited to hear from you, how our website was used and what points Steve Krug made about it. Here is the local copy of Steve Krug’s Powerpoint presentation. UPDATE March 9: Added local page with Steve Krug’s presentation and link to Gadgetizer. This entry was posted by Jesper Rønn-Jensen	on Wednesday, March 8th, 2006 at 23:31 (GMT-1)	and is filed under Accessibility, justaddwater.dk. You can follow any responses to this entry through the RSS 2.0 feed. Both comments and pings are currently closed. Thanks for notifying me. I just corrected the link, so it points to your blog article. I found your article very relevant and interesting. Hence the Dutch/Flemish translation. I found the article extremly enlightening. Thanks for the link to Gadgetizer.